University Officers in Dr.YSRHU, Dr Y.S.R. Horticultural University Dean, Director, Registrar Posts 2017: Dr.Y.S.R Horticulture University has published the University Officers recruitment notification and applications are invited in the prescribed form for the posts of University Officers in Dr.YSRHU. All information pertaining to number of vacancies, qualifications, registration fee, general, application form, how to apply, last date for apply and other information is available in the University website www.drysrhu.edu.in. 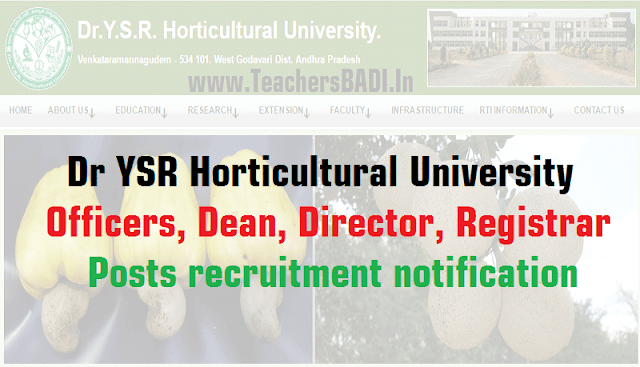 Dr.YSRHU, Venkataramannagudem Dean, Director, Registrar Posts: Dr.Y.S.R.Horticultural University, Venkataramannagudem invites applications for the following posts. a. Bachelor’s Degree in Horticulture/Agriculture. d. Minimum of twenty years of experience in Teaching / Research / Extension / Administration in Horticulture, out of which atleast five years should be as Professor / Principal Scientist / Associate Dean or equivalent rank. e. Significant professional achievements in his/her field of specialization/activity. a. Knowledge and experience of planning, organizing and administering teaching programmes and curriculum development. b. Experience in Teaching is desirable. c. Working experience in Horticulture field. d. Unblemished record throughout the career in the past. c. Ph.D Degree in Horticulture or any related disciplines of Horticulture Administration in Horticulture, out of which atleast five years should be as Professor / Principal Scientist / Associate Dean or equivalent rank. a. Knowledge and experience of planning, organizing and administering Teaching/ Research programmes and curriculum development. c. Ph.D Degree in Horticulture/Agriculture. d. Minimum of twenty years of experience in Teaching / Research / Extension / Administration in Horticulture/Agriculture with 5 years experience in Horticultural crops. e. Atleast five years should be as Professor / Principal Scientist / Associate Dean or equivalent rank. a. Wide experience of student problems, management and placement. b. Training and experience in organizing co-curricular and extra-curricular activities of students. d. Minimum of twenty years of experience in Teaching / Research / Extension / Administration in Horticulture / Agriculture, out of which atleast five years should be as Professor / Principal Scientist / Associate Dean or equivalent rank. e. Should have worked in Research for alteast five years. f. Significant professional achievements in his field of specialization/activity. g. Experience as part of duties in conducting basic/applied research of high quality as evidenced by published work/technologies developed. a. Knowledge and experience of planning, organizing and administering research programmes. b. Working experience in Horticulture field. c. Unblemished record throughout the career in the past. f. Significant professional achievements in his/her field of specialization/activity. a. Knowledge and experience of planning, organizing and administering extension programmes. a. Wide experience in setting & moderating the question papers & conduct of examinations. b. Should have the experience in counseling of admissions. c. Working experience in Teaching and Horticulture field. d. Unblemished record throughout the career in the past. d. Minimum of twenty years of experience in Teaching / Research / Extension / Administration in Horticulture/Agriculture out of which atleast five years should be as Professor/Principal Scientist/Associate Dean or equivalent rank. e. Minimum of five years of administrative experience as head of the Institute/Station in a responsible management position dealing with academic matters / research and extension management / service matters and financial matters. a. Unblemished record throughout the career in the past. a. Must have B.E. degree in Civil Engineering of a recognized University. b. Must have rendered service as an Executive Engineer in Government/Quasi Government or University for not less than 10 years with an excellent record. c. Experience in designing, estimating and construction of Educational and Residential buildings and complexes on large scale. d. Experience in designing, estimation and construction works related to water supply, sanitary and electrical works pertaining to buildings in large scale. a. Experience and qualification in ground water survey and execution of irrigation projects. b. Experience as a Superintending Engineer in execution of building works spread out in a large jurisdiction. Filled in Application Form along with Registration Fee should reach the Vice-Chancellor, Administrative Office, Dr.Y.S.R.Horticultural University, Venkataramannagudem, West Godavari District on or before 06.12.2017.